Here’s sending good wishes and prayers to tennis champ, and HSN vendor, Serena Williams. It turns out that Williams, who has undergone two recent foot surgeries, last month was hospitalized for a blood clot in the lungs, a pulmonary embolism. The woman that The New York Times calls “one of the greatest players in the history of her sport” will likely have to be on anti-coagulant drugs for six months, according to The Times. On Monday had to go to Cedars-Sinai Medical Center in LA to be treated for a hematoma, or bleeding under her skin, which was apparently caused by the aniti-coagulants she is taking. She had been hospitalized Feb. 19 and 20 for her embolism, according to The Times. If Williams was to be on anti-coagulants when she plays in U.S. Open this summers, she risks what would typically minor bleeding become major bleeding, especially if she is hit in the head. Willliams has always been down-to-earth and charming during her HSN appearances, so we hope she overcomes her medical problems as quickly as possible. She does a line of jewelry and accessories for the home shopping channel. A day after QVC said it was bringing back the “new” Black Friday, HSN put out a press release about its star-studded Thanksgifting Weekend festivities. The biggest attraction will be pregnant pop diva Mariah Carey. This promo is set to Carey’s single “Oh Santa” from her new album Merry Christmas II You, and showcases an array of products. “This was one of the most creative campaigns HSN has ever produced and was designed to give our customers a window into the best of the holidays and gifts,” Andrew Sheldon, HSN’s EVP of Television & Executive Creative Director, said in a canned statement Thursday. HSN’s holiday campaign is airing on all of its shopping platforms and will also be in rotation on cable operators covering 95 million homes as part of HSN’s cross-channel marketing efforts. •	Nov. 19 – Twiggy presents her LONDON fashion line, while TV actress and fashion model Molly Sims offers the latest in fashion jewelry. •	Dec. 2 – Iman showcases newest fashion, jewelry and accessory designs. •	Dec. 3-5 – Chef Wolfgang Puck provides cooking tips for the holidays. •	Dec. 3 – Entertainment expert Colin Cowie presents the best in holiday entertaining. •	Dec. 4-5 – Decorating expert Nate Berkus offers distinctive styles for your home. •	Dec. 7 – Serena Williams serves up more of her jewelry, accessories and more. •	Dec. 8-9 – Culinary celebrity Padma Lakshmi showcases her collection of natural spices, teas and teapots. •	Dec. 10 – Mary J. Blige returns with her exclusive fragrance with HSN, My Life. •	Dec. 12 – Chef Todd English with his cookware. As part of its efforts to make shopping as convenient as possible over the holidays, HSN is leveraging all of its platforms to enable customers to shop where, how and when they want – on TV from the comfort of their home, on hsn.com, or “on the go” on their iPad, iPhone or android handheld device. Exciting surprises are also available online. Customers can play HSN’s “Great Gift Giveaway” and have the opportunity to win $100,000 in gift prizes, including HSN gift cards, and eight electronic packages, each valued at $2,000. The game is also available on HSN’s Facebook page and mobile app on the iPhone – and is featured on-air ever Friday at 4 p.m. during the Gift Friday hours. Is HSN Bouncing Beyonce’s Mom, Miss Tina, From The Home Shopping Network? It looks like HSN is discontinuing yet another clothing line, and this time the exit door is being given to Tina Knowles, mother of pop superstar Beyonce Knowles. Mama Knowles, who used to design costumes for Destiny’s Child before Beyonce split off from that group, has been doing a clothing and accessory line for HSN called Miss Tina By Tina Knowles. The collection included not only clothing but also jewelry, shoes and handbags. But currently all of Miss Tina’a merchandise on HSN.com, the little of it there is left, is on clearance. The line included some clunkers, like a skirt attached to leggings. But it also had more classic pieces, especially the purses. We asked HSN for a comment Thursday, and the network said it was getting something together for us. We still don’t have anything from them. HSN, under new CEO Mindy Grossman, has replaced many of the channel’s veteran vendors, such as Suzanne Somers, with hipper, more upscale and notable designers, such as Badgley Mischka. Miss Tina would be the second African-American designer to lose her line on HSN. This year Terry Lewis, a former HSN host who did a collection called Classic Luxury for her former employer, also lost her spot on the network’s roster. Of course, HSN has ended its relationship with many Caucasian vendors, as well, but the exit of Miss Tina might not sit well with some viewers, especially black customers of the No. 2 home shopping network. We heard from fans of Lewis who were not happy about her departure. That would self-defeating for HSN, which of all the three major electronic retailers seems to have made a real effort to use African-American vendors and court African-American customers. HSN’s black vendors include Iman, Serena Williams, Carol’s Daughter, Sean ‘Puff Daddy” Combs, Antthony Design Originals and Natalie Cole. And Saturday singer Mary J. Blige will do the exclusive premiere of her perfume, My Life, on HSN. Get this: both the Atlantic Monthly and Bloomberg Businessweek have stories on home shopping networks, namely QVC and HSN, respectively. Thanks to our friend Mike Squires for tipping us off to this. If you are home shopping fans, we think you’ll enjoy the behind-the-scenes look these two articles offers. The Atlantic story is headlined “The Genius of QVC,” and author Megan McArdle fesses up to being “a closet fan” of the No. 1 home shopping network. She bases much of her story on a tour she took of QVC’s studio in West Chester, Pa. The article offers up many facts about QVC that we were never aware of. The article, which is well worth reading, also discusses the emotional tie that viewers develop with home shopping hosts. The story in Bloomberg Businessweek, titled “HSN’s Fashionista,” focuses on the changes that CEO Mindy Grossman has brought to the No. 2 home shopping network. The story kicks off describing HSN as the home of Suzanne Somers and her ThighMaster to tennis champ Serena Williams blowing out her HSN line, but jewelry to apparel. “When Grossman was recruited for the job in 2006 by Barry Diller, chief executive of HSN’s then-corporate parent AC/InterActiveCorp, she told Diller that she would accept only if he gave her the freedom to turn the place upside down,” the story says. “She wanted to transform HSN by making it more modern and tasteful: Maybe it would never be hip, it certainly wouldn’t try to be edgy, but it could at least be relevant,” Bloomberg Businessweek says. Grossman viewed HSN a second-rate QVC, and went about changing that. The story says “Grossman, 52, is sleek and stylish, and she likes to pile on the necklaces and bracelets when she dresses. If women ask her for advice about accessories, she always says: ‘more. '” It doesn’t get into the fact that Grossman likes to show a little cleavage during business presentations. Want to know how Grossman got those fancy Manhattan designers to come over to the dark side? This valentine to Grossman closes with Williams, and offers some hard numbers. “During her 24-hour visit, HSN sold $3.25 million worth of products; Williams accounted for about one-third of it. The 1,900 pairs of jeans are gone. So are the maxi dresses,” the story says. Tennis star Serena Williams has HSN’s Today’s Special Friday, a boyfriend-style sweater for $40. The sweater, which comes in 10 colors, has a matching sequin scarf for $19. Williams is on the air now and looks cute with a super-straight chin-length bob with bangs. Her Signature Statement collection for HSN includes not only apparel and accessories but also an extensive fashion jewelry line, with many flashy pave pieces. “You know I love jewelry and wear it all the time when I play,” she said Friday. Williams has so many shows today on HSN they should call it the Serena Channel. Tennis champ Serena Williams will be on HSN Friday nearly 24/7, kicking off at midnight with the network’s Today’s Special. Williams will be on throughout the entire day with her Signature Statement collection, which includes apparel, jewelry, handbags and accessories. We especially like her ruched dress at $55. And of course, we love that bling. Bring it on Serena, with a very pretty crystal flower necklace catching our eye at $80. HSN has a wide range of African American vendors on the air, not only Williams but also Natalie Cole, Sean Combs, Iman (David Bowie’s wife), Tina Knowles — who is Beyonce’s mom — and Carol’s Daughter. HSN CEO Mindy Grossman Shows Some Cleavage In Her Video: What Kind Of Message Is That? HSN’s Mindy Grossman is the first CEO we have ever seen show cleavage during a company presentation. Not that there’s anything wrong with that. We guess. On Wednesday we first spotted a video clip called “A Message From CEO Mindy Grossman under “company overview” on HSN.com. In the seven-minute video, Grossman gives investors and customers an eyeful, along with an update on the nation’s first home shopping channel, founded in 1977. Grossman is wearing a low-cut, V-necked black sweater, and she’s rocking some cleavage. Now would QVC CEO Mike George or ShopNBC CEO Keith Stewart do that? Anyway, Grossman does her spiel about how her strategy is working at HSN, which is in its second year as a public company. “HSN is a non-stop, 24-hour, 365-day retailing giant,” Grossman says, noting that the network is in 93 million homes. The executive also cites some of HSN’s vendors and lines, including Iman, Serena Williams, Wolfgang Puck and Lancome. We think Grossman, a veteran of Nike, may be wearing a Heidi Daus bracelet. We’ve looked as close as we can, but we’re not absolutely sure. Even though its third-quarter sales slipped a hair, HSN has momentum and is upbeat about the coming holiday season, according to company officials. 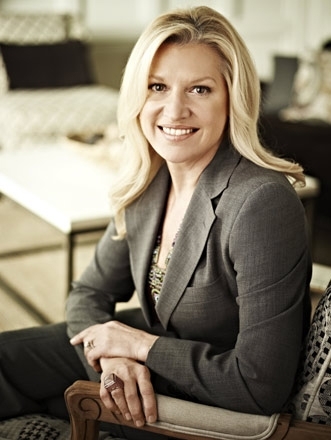 During a third-quarter conference call Thursday, HSN CEO Mindy Grossman fielded questions from Wall Street analysts about the company’s outlook for the rest of the year. “We’re optimistic going into the fourth quarter and seeing the trends continue from third quarter across multiple categories of the business, whether it’s new innovations in technology or, as you mentioned, in the ‘Her Side’ of the business,” Grossman said. “We feel that both from an inventory perspective and a product-pipeline perspective we’re very well positioned going and in the quarter from everything from our gift strategies all the way to some of the new product introductions that we have had a lot of success with consistently,” she said. Net sales for the HSN network and Web site (excluding HSN Inc.’s Cornerstone unit) decreased in the quarter to $467 million, versus $471 million last year, down 1 percent. However, operating income increased 115 percent to $37.1 million compared to $17.3 million in the prior year. The network’s return rate dropped to 19.5 percent in the third quarter from 20.3 percent in the prior period; and inventory was down 15 percent. In contrast to HSN, QVC saw its sales rise slightly in the third quarter. Earlier this week, QVC domestic posted $1.098 billion in revenue in the third quarter, a 2 percent increase from $1.073 billion in the year-ago period. At HSN in the third quarter, gross profit increased 8 percent to $168.6 million. Unit growth was up 6 percent. The No. 2 home shopping network has seen growing success with its fashion, beauty and jewelry lines, the “Her Side” of the business, according to Grossman. “We have transformed our fashion businesses, exited unproductive brands and invested in the creation and developmemt of proprietary lifestyle brands with talented individuals who can bring a unique point of view to our customers,” Grossman said. She cited as examples red-carpert designers Bagley Mischka, actress Molly Sims, rock star David Bowie’s model wife Iman and tennis champ Serena Williams. There was no mention of actress-author Suzanne Somers moved from HSN to ShopNBC during the third-quarter. The CEO cited the line by Stefani Greenfield, Curations. “We are now recognized in the fashion industry as a destination with strong leadership, innovation and a successful track record,” Grossman said. In terms of the beauty category, HSN has added brands such as Benefit and Lancome, as well reaping success with its proprietary brands, such as Jennifer Stallone’s Serious Skin Care and FranBrand, the skincare line launched this week kby actess Fran Drescher. HSN’s launch of Serious Skin Care’s Firma-Face in just four days in September sold almost 100,000 units, and more than 60 percent of customers signing up for Autoship, to ensure regular delivery, according to Grossman. HSN has adjusted its jewelry product mix, resulting in unit growth of 13% this quarter, she said. Silver and fashion jewelry continue to be strong, with sales up 30 percent over last year “as customers responded to our wider range of price points and new designer introductions,” Grossman said. She added that she is looking forward to the launch of Molly Sims’ jewelry line, Grayce, later this week. Despite the dire economny, there was a 7 percent growth rate in sales from HSN’s best customers. She explained that HSN is offering “The World of Carlos Falchi” and “Global Chic” from Iman. Tennis star Serena Williams made her debut on HSN today, and watching her, you would never pick her out as someone who had lost her temper and thrown a fit at the U.S. Open. Williams was utterly charming, like someone you would like as your BFF, as she peddled her jewelry, clothes, handbags and other assorted accessories. Affable Williams had HSN’s Friday “Today’s Special,” a “Rings of Bling” woven leather bracelet. When you are a guest with the “Today’s Special,” it’s as grueling as getting ready for a big tennis match. You are on-air at midnight to introduce the “Today’s Special,” and then must appear throughout the day to do presentations on it. So you are on TV from midnight to 2 a.m., then back at 10 a.m., then back in the afternoon and back again in the evening. Not much time for sleep or rest. Nonetheless, Williams was cheery and looked fresh each time she appeared to talk about her jewelry and other wares. That included a CZ-pave medallion that Williams said she had worn during an appearance on CNN, and her own handsome version of a tennis bracelet. Host Colleen Lopez said that Williams had a background in design. Who knew? You are currently browsing the archives for the Serena Williams category.